Isn't this just Hutt Ball in first person? The SWTOR game. I thought the exact same thing. TF2 Hutt Ball. 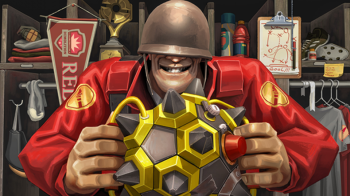 On a more serious note, I often wonder how much money and profit Valve has made from TF2 and it's hat based economy versus the churn out a new title every year approach that the other big publishers use. Seems very similar to Bombing Run from UT2K4. That just sounds like grifball with guns. Nah, unlike Grifball, there's actual terrain. Honestly it's more like Halo 4's Ricochet mode. Huttball was always the most fun PvP mode in SWTOR, glad to see it coming to TF2. It added a whole new dynamic to the game and made knockbacks incredibly valuable. I gave it a try. While it definitely has potential, it reminded me why I don't play competitive games in public matches, or why I don't play TF2 for extended periods of time. But i've also seen a few neat tricks as well, such as a soldier using the rocket jumper and having someone pass the ball to him right as he rocket jumps, letting him carry the ball over the sentry line to dunk into the goal. A pyro makes a good goalie by airblasting/catching any throws at the goal. People finally AREN'T sniper/spy spamming, and a good sniper/spy can be of good use in the match. Also for some reason, any alternate-fire related to the melee weapon also steals the ball, such as hitting the carrier with a baseball from the sandman.